For eight Saturdays every Spring and Fall, the fields at the Warwick Town Park on Union Corners Road are filled with children of all ages and abilities, on over 70 different teams, playing soccer. Since its inception 14 years ago, the Warwick Soccer Club has provided the opportunity for untold numbers of Warwick’s youth, ages 4-17, to play recreational soccer in a fun, family oriented atmosphere. The goal of recreational soccer is to teach the fundamentals of the game, encourage success through practice and teamwork, all the while emphasizing that good sportsmanship is more important than winning the game. The recreational teams of the Warwick Soccer Club are coached by parent and teenage volunteers who give up several hours a week to hold practices and coach at games. With the opening of the Concession Stand in 2002, parents also chip in and support the Club by working the Stand throughout game days. The Club itself is run entirely by a group of dedicated volunteers who see to the registering of players, creation of teams and schedules, field maintenance and repair and other administrative duties that make each season run smoothly for all. Additionally, the Club provides employment opportunities for Warwick’s teens by training them as referees. Most of these teen referees started playing soccer as youngsters in this very program and many have gone on, with further training, to referee at higher levels. The success of the Warwick Soccer Club has been its philosophy that all children, no matter their size or ability, are capable of learning the fundamentals of soccer and increasing their skill and understanding of the game with every season they play. 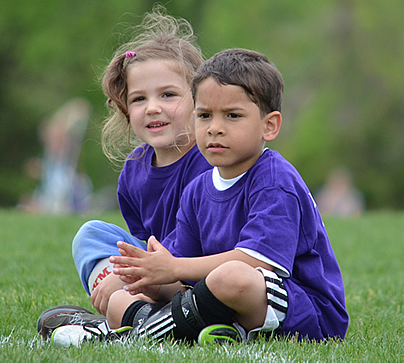 Friendships among players and parents are forged as families come together each week to watch their children improve, learning to win and lose without losing their sense of fair play and sportsmanship. As the children get older the spirit of competition increases, yet the fundamentals of teamwork and sportsmanship, an essential element of growing up, still prevail. For the 1,000 or so children playing soccer on Saturdays in Warwick, this will always be the goal of the Warwick Soccer Club.